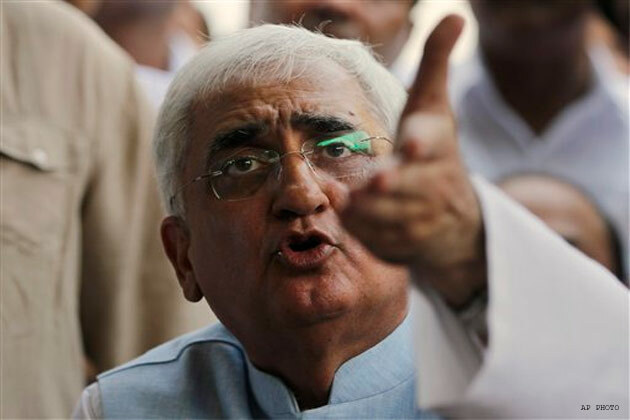 New Delhi: In the latest development with regard to the controversy surrounding Union Law Minister Salman Khurshid, the Congress leader on Wednesday threatened anti-corruption crusader-turned-politician Arvind Kejriwal, saying till now he has been wielding a pen and "it is time to replace ink with blood". He said, "I was made the Law Minister and asked to wield a pen…now it is time to replace it with blood." Launching a scathing attack on the India Against Corruption (IAC) member, the Law Minister said, "Let him (Kejriwal) come to Farrukhabad, but how will he go back…Kejriwal says he will ask the questions and asks us to give the answers, you have heard what we have to say, you will forget the questions." Reacting to Khurshid's threat, Kejriwal tweeted, "Mr Salman Khurshid has threatened me. The language that he has used does not suit the Law Minister of the country. Killing me won't help as the whole country has woken up. Hundreds of other Kejriwals will rise. Rather than threatening like this, it would be better that Congress sensed the anger of the people and took some concrete steps against corruption." Key Indian Against Corruption member Kumar Vishwas reiterated that they would go to Farrukhabad and dared Khurshid "to do whatever he wants to do". Speaking to CNN-IBN, Vishwas said, "He is threatening us but I want to tell him that we will go to Farrukhabad and he can do whatever he wants to do. I have doubt on his Oxford education." He further said that President Pranab Mukherjee should take a note of the threats by the Union Law Minister, alleging that Prime Minister Manmohan Singh was not taking any action in this regard. Vishwas, a key aide of Kejriwal, called it "a direct threat". Vishwas further said, "Arvind has said that we are not going to give up this fight, this will not deter us," adding that an apology by the minister would not do as he should apologise and also step down. Bharatiya Janata Party (BJP) leader Mahesh Jethmalani also hit out at the Union Law Minister over the issue, saying, "The language used is most unfortunate, especially coming from a well educated minister." He said that the statement of the Law Minister would lead to an act of criminality.